Prayer - Be Positive and Happy in Tough Times. Messiah, Your love never fails! I speak peace into the lives of my families, loved ones and friends. Calm their spirits, Oh Lord, as they sail through the rough waters. Allow Your unspeakable joy and happiness to infiltrate their hearts and souls so they can be positive and happy in tough times. Let them freely dance in the rain, Oh Father, as they look to You in every situation. Psalms 37:3 Trust in the LORD, and do good; so shall you dwell in the land, and truly you shall be fed. Proverbs 16:20 He that handles a matter wisely shall find good: and whoever trusts in the LORD, happy is he. Free me of every stronghold that prevents my smile. Sadness, discouragement, despair, lack of hope, misery, pain, hurt, anger and misfortune fall away at the sound of Your great name. Lift my spirit, Oh wonderful Savior. Take complete and total control! Psalm 30:11-12 You have turned for me my mourning into dancing; You have put off my sackcloth and clothed me with gladness, To the end that my glory may sing praise to You and not be silent. O Lord my God, I will give thanks to You forever. Allow the Joy of the Lord to be revived within my heart today. Let positivity emerge from the darkness and bubble in my soul. I declare and decree that happiness will bless us, as we go forth with positivity. In Jesus’ mighty name, Amen. I praise You my dear Heavenly Father.The maker of heaven and earth. I will be positive in everything I do.I will be blessed and success in my life. I will follow the word of God to do good and be positive in my everyday life. Let me start today,to be positive,that happiness will bless my life.Bring me peace,health,love and abundant blessing in my life. I praise and worship you my heavenly father. Guide me and bless my family, my students as the school will start next Monday. Especially my son so that he will behave in class and take his studies more seriously. Amen. 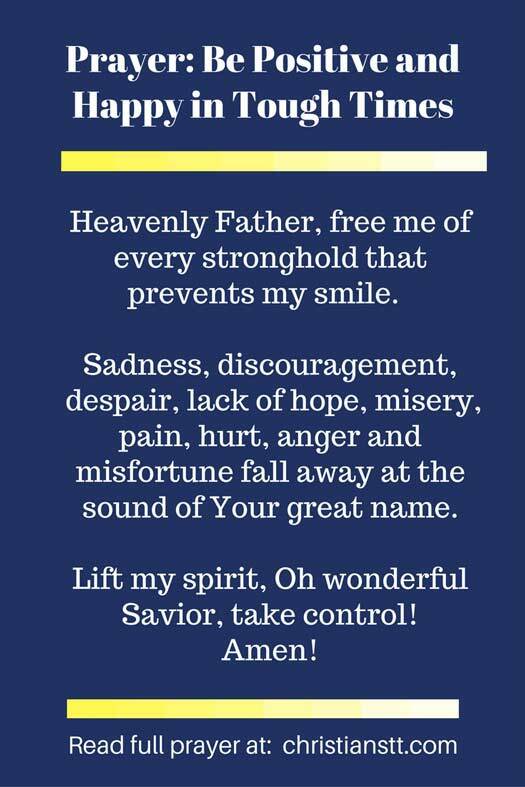 Amen may you find the strength to carry on. I praise and worship You my dear Heavenly Father,and I bless Your Holy Name and honor You dear Lord,with all my heart. I learned the word of God,by reading the Bible. The word of God teach me many things,to do good and be positive in my everyday life.So that I can change my life,how to get a better life and praise God. It’s can change my life to be a better person. Dear God,Please give me the strength to be positive and happy in every times. Bless me in everything I do dear Father God,I will success in my life. I identify with music in my life. The song by Carrie Underwood felt like a bandage covering up all the wounds of my life. Thank you for always looking out for me, Lord. I praise You my dear Heavenly Father.I need You dear God,help me always do good in all things and be positive in every situation in my everyday life. I declare that today, happiness will bless me in everything I do and I will success.Amen. Dear God,In the name of Jesus,please stay with me and give me the strength to Be Positive and Happy in Tough Times. In the mighty name of Jesus I pray. Amen! Thank you for the encouraging prayer Cheryce. I’m trying to stay & remain positive. Help me pray for my mum & her sister. They are both unwell & in hospital at the moment. where I believe the holy spirit is guiding the medical team. Found my mum sat on the edge of the bed semi conscious when l got back home from school. Stroke of the left side was announced after an MRI scan. It happened when she was all alone????. Her sister is generally unwell. Thank you for taking your time to read & pray for my family & all those unwell . stand strong to see this beautiful bless morning,to embrace the good day. do and thank you for Your many blessings in my daily life. Dear Father,I put my trust in You forever and ever. Thank you for Your guidance You give through Your word. Thank you so much for this Good morning prayer. All praise to you for ever. Family problems are easier to cope with when we look to our Heavenly Father/Bible in council. So dear Husbands love your Wives and treat her lovingly as Jesus would. A family is like an Organization so Jesus would want us wives to submit to our husbands having headship over the family and follow the words in Proverbs 31:10.Fathers should preside over their families with respect,kindness and goodness. .And lastly Children should obey their Parents as in Colo 3:20 states. None of us in our family are perfect, for we all make mistakes. So be kind to each other and forgive, fill your home with positive emotions and add to your families sense of happiness if you can. The One that loves you the most will help and guide you each step of the way. “Dear children, let us not love with words or speech but with actions and in truth”. Thank you Ms. Miller for those wise words. My family has been affected harshly by divorce. My ex-wife and I divorced ten years ago. I pray every day for my two daughters, twenty and seventeen years of age. It has been a tough ten years. I also pray for myself and my ex-wife. I know Jesus carries me in times of trouble and uncertainty. Amen. GLORY GLORY GLORY TO YOUR NAME FATHER!!! Amen! God bless you Cheryce. It’s good to be positive and happy as the Lord is good at all times.